This is our most popular offering. This Special Value Package provides enough product to complete the 6 week Foundation Program and the additional 3 bottles provide you enough for 1 year of the minimum recommended Maintenance Program. This is also a great option for those who wish to share the benefits of Cardio Renew with a loved one. There is enough product for both of you to complete the 6 week Foundation Program or both of you 1 year of the minimum recommended Maintenance Program. Do NOT use if you have Liver or Kidney disease or any condition affecting blood cells or the immune system. Do NOT use if you are Pregnant or Nursing. 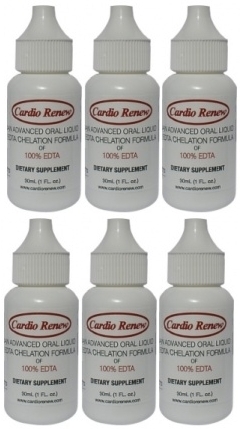 Cardio Renew is highly concentrated. You MUST mix Cardio Renew with 2 ounces of a mineral free liquid. Avoid direct contact with skin and eyes, flush immediately with water if direct contact does occur. Because Cardio Renew's EDTA formula is Sodium based, people that are extremely sensitive to Sodium (i.e. salt) should monitor their blood pressure during the Program. Cardio Renew is NOT intended for use by children. Please review our disclaimer.